The great thing about heat pumps is that they use the ambient air surrounding the unit to actually heat the pool up. Air passes over an evaporator coil, which uses a heated refrigerant to heat water and then return it back into the pool. The upside is that it has very low running cost, but the initial cost for units can be pretty high. They also require the outside temperatures to be over 50 degrees, which is perfect if you’re trying to open your pool now. Getting a solar cover is another great way to cheaply reap the benefits of heated pools. Harnessing the power of the sun, all you have to do is leave a solar cover over the top of your pool whenever it’s not in use to keep it nice and warm. It’s a good idea to also invest in a reel so you can easily draw the cover in and out. This will improve the function of your solar cover massively and make it easy for everyone to use. You might have already decked your pool out with a nice enclosure or a fire pit, but it’s time to get high-tech with your pool as well. Solar panels are used as a power source for people’s homes, but they can also be used specifically for your pool. There are both roof mounted and ground panel options depending on what your heated pools need. 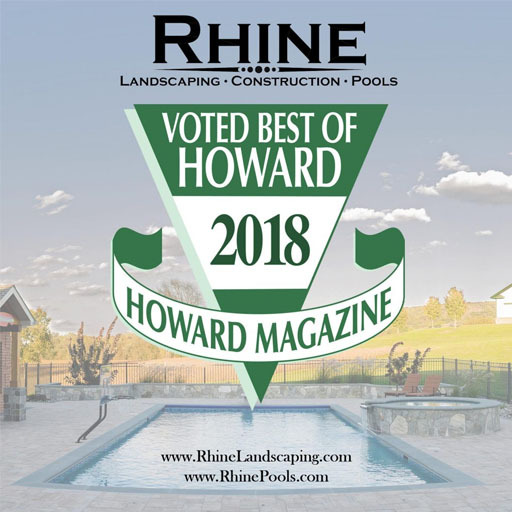 If you’re new to pool care or just want your spring pool opening handled by professionals, Rhine Pools is here for you. We are an all-inclusive company, so you won’t need to worry about working with ten different project managers and faces over the course of your project. Spring is a great time to step up your outside aesthetic, our services include patios, decks, shade structures, fireplaces, outdoor kitchens, water features, plantings, lighting, and even more! Whatever you want as part of your pool and landscaping, Rhine Pools can handle the job! For more information and details on proper pool maintenance, give us a call at (410) 442-2445 or visit us online. For more pool design tips, follow us on social media at Houzz, Facebook, Twitter, Pinterest, YouTube, and Google+.